Edinburgh based water retailer, Business Stream has won a top international award recognising its innovative approach to customer service. The firm won Best Digital Transformation at the International Customer Experience Awards hosted in Amsterdam on 20 November 2018. 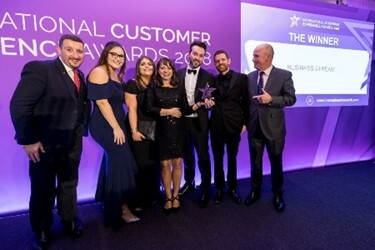 Judges recognised the transformation Business Stream made after it acquired Southern Water’s non-household customer base ahead of the opening of the English water market in 2017, which doubled the size of its business. The firm worked with Capgemini, a global leader in consulting, technology services and digital transformation, to help enhance its onboarding process for large, multi-site customers. Over 100 companies from across Europe were shortlisted for the annual awards held in Amsterdam’s city centre. Business Stream works with private businesses and public sector organisations across the UK. Earlier this year it announced plans to help its customers reduce their water consumption by 20 per cent. The pledge, announced by the firm’s CEO Jo Dow, forms part of Business Stream’s on-going commitment to promote the importance of water efficiency and to proactively work with its customers across the UK to reduce their water use. The new £2.5B English water market, which opened in April 2017, enables 1.2 million businesses and public bodies in England to choose their water supplier for the first time. In the first year of the English market Business Stream secured over £155M in new contracts. To date, Business Stream has helped its customers save over 38 billion litres of water, resulting in almost £75M in financial savings and over 66,000 tonnes in CO2 savings. Business Stream is the largest operator in the Scottish non-domestic water market. Headquartered in Edinburgh, it also has offices in Glasgow and Worthing, and employs over 370 staff. The English retail water market, which opened in April 2017, has paved the way for over 1.2 million businesses and public bodies in England to now choose their water supplier for the first time. Business Stream acquired the non-household customer base of Southern Water in preparation for the English retail water market. The acquisition doubled Business Stream’s customer base overnight, making it one of the largest retail water suppliers in the UK. Since retail competition was introduced to Scotland in 2008, Business Stream has saved businesses and public sector organisations more than £213M and helped them conserve over 38 billion litres of water. These benefits include £74M in water efficiency savings, more than £128M in discounts and over £9M in energy efficiency savings. The company is a wholly-owned subsidiary of Scottish Water with its own board and independent management team. It was formed in 2006 with the goal of providing a first class service for business customers on the opening of the competitive market. For more information, visit business-stream.co.uk.